Dinners and drinks and walks and good (and sometimes hard) conversations (offline and online, in our homes and in town) with friends (you know who you are). Lots and lots of studying for my Stedenbouw exam (city development). I got an 8 out of 10, so it was worth it. Guido donned himself with a study advisor-hat and sat down with me to take a good look at my study planning for the upcoming months. I gasp every time I think about the amount of hours I have to study each week to make things happen, but since the OU has stopped allowing students to renew their rights to participate in a class, I have to get rid of my backlog of courses over the next 13 months. I've picked up Ethics again and will work on Project management and finishing some writing assignments as well over the next few months. Bird watching with poes Poes. She checked behind the screen several times, to see where we had hidden the birds. Museum night at Meermanno. 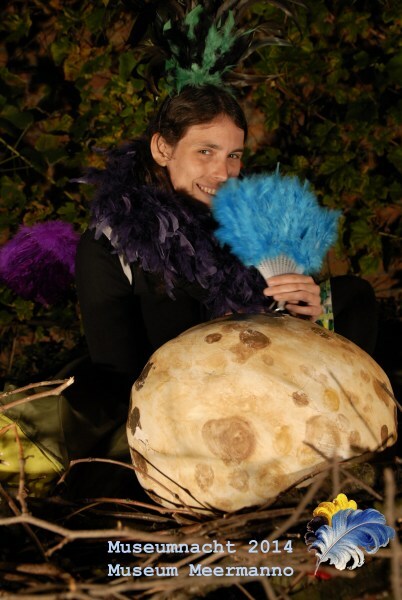 I spent several hours at the door welcoming and goodbyeing guests and then sat in a birds nest after a photographer and a few colleagues had dressed me up in all kinds of feathery things. Tweet! J. and I spent a day in Eindhoven. We had a sort of crunchy mango milkshake, visited the Van Abbe Museum, found a well-hidden geocache, walked around town and enjoyed some unhealthy stuff for dinner. Film night in The Hague. Greek for dinner. It was Pathé month, I went with half of the group to see Guardians of the Galaxy. Low expectations but it turned out all right. Now I want a Groot. But without Vin Diesel's voice please. A few episodes of Doctor Who with Maarten. Starting to get used to Capaldi. But man, that Robots of Sherwood episode?! I miss the good old days with the brilliant wit of Russel T. Davies. I attended fantasy fair Elfia in Arcen with Bram, Guido and Annelies. The castle gardens make such a wonderful backdrop for all the elves and wizards and knights and such. Dinner with Roeland, Bram, R. and M., followed by Settlers of Catan with Roeland, Bram and R. and a walk with Bram. New happy socks (bought them at Flying Tiger). Nice pictures, I especially liked the Poes vs. birds ones. And best of luck with your studies! One thing though: The proper English name of Kolonisten van Catan is The Settlers of Catan (after the original German title Die Siedler von Catan).